The frazzled world needs many Ram Singh Mundas. Let the Administration not ruin the only Ram Singh Munda available at present. Ram Singh Munda has gone back from Bhubaneswar to his village in Keonjhar with the feeling that peoples of Orissa love him and totally appreciate his humane nature and the way he has nurtured Rani by rescuing her from the grip of death. But he may go back to Jail if a mentally dull officialdom in the lower level of Orissa’s Forest Department is not discouraged from wild use of the Wildlife Protection Act against him in total disregard to the noble qualities the innocent tribal personifies. Released from Jail on bail, he had rushed from his village Rutisila under Ghatagaon Block of Keonjhar on June 27 to Bhubaneswar to meet Rani in Nandanakanan zoo. His six-year-old daughter Dulki, orphaned by her mother, had also accompanied him. The entire learned world by this time has known her. She is a bear cub, rescued around eighteen months ago from the grip of death while lying abandoned and dehydrated in the Jungle. Ram Singh Munda had given life to the hopeless cub by bottle-feeding her curtailing his daughter’s food out of sheer compassion and had adopted her and given her the name and had given her the comfort she so badly was in need of then to survive. A widower, rearing his baby daughter, Ram Singh knew the agonies of a motherless child and hence he knew how to take care of Rani. By limitless love, he had convinced her that she was neither orphaned nor abandoned. When he visited Nandankanan the scenario that suddenly manifested was to be seen to believe. 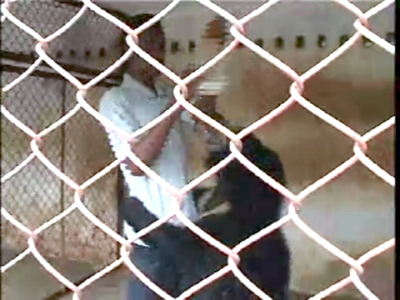 Rani, thrown into an isolated enclosure by forest officials, refusing to receive food and lying dejected, in a fraction of a second danced in delight as Munda knocked at the wire walls of the enclosure and the moment was so emotionally surcharged that the officer in-charge present on the spot could not know that he was defying the rules of the zoo as he ordered his men to open the gate and allow Munda the pleasure of the bear’s grateful hugs. It was a rare reunion of a father (the man) and a daughter (the bear) the like of which the world has never seen so far in real life. This establishes beyond doubt that Ram Singh Munda had not only rescued the bear cub from grip of death, but also had reared it as a father rears a motherless child. It also establishes that Rani is not at all wild. Use of Wildlife Protection Act against this man who is nothing but a protector of wildlife exposes how mentally dull is the officialdom in lower level of forest department. Why Ram Singh Munda was in the jail? Ram Singh Munda, a tribal and a natural lover of the forests, had developed a fancy to dress up like a forest guard. But private use of Khaki not prohibited in Laws and the dress he was using not being the uniform, the local staff of forest department was unable to stop him, even though, that was bruising their official ego. On the other hand, people of the locality were making fun of the forest guards comparing them with Ram Singh Munda, as to them, though not in government service, he was a real lover of forests than the local foresters who were drawing salary from the state exchequer but hobnobbing with the jungle looters. They were morally shying at Ram Singh but internally waiting for opportune time to smash him. The highly rich flora and fauna of Keonjhar District are no more discernible. For such a deplorable deterioration of the once enviable eco-system, though frazzled by authorized and unauthorized mining, in public perception the responsible factors lay in the deficiency and deliberate dereliction in duty coupled with corruption in the lower offices of forest department. So the low rank forest officials were in search of something that may project them as active and sincere in their duties. Ram Singh Munda’s association with the bear provided them with the solution. By catching hold of Ram Singh Munda and sending him to the heartless zone of law where jailing some one without complete assessment of an allegation is a privilege, the forest officials of the concerned area have in their own way built up a showcase in their support. They have charged him for contravention of Sections 2(16) / 9 / 39(3) / 40 and 42 of Wildlife Protection Act, 1972. Let us take a cursory note of what mischief these Sections are up to. Section 9 says, no person shall hunt any wild animal specified in Schedule, I, II, III and IV except as provided under section 11 and section 12 as amended when Sec.2 (16) defines “hunting” as “capturing, killing, poisoning, snaring, and trapping of any wild animal and every attempt to do so”. When Sec.39 shows wild animals as government property, sub-sect.3 thereof at cl. (a) discourages a man to “acquire or keep in his possession, custody, or control” a wild animal sans prior permission of the Chief Wildlife Warden or his authorized officer. Section 40 under sub-section (2) repeats almost the same thing as it prohibits everybody to “acquire, receive, keep in his control, custody or possession any animal specified in Sch. 1 or Part 11 of Sch. 11 except with the previous permission in writing of the Chief Wildlife Warden or the authorized officer”. And, Section 42 gives power to the Chief Wildlife Warden to issue, for the purposes of Sec. 40, “a certificate of ownership in such form, as may be prescribed, to any person who, in his opinion, is in lawful possession of any wild animal”. If anything, prosecution of Ram Singh Munda under these provisions is most farcical of law. Firstly he has not “hunted” Rani. He has “rescued” Rani from the grip of death. And rescuing an animal is not illegal under Section 9. Secondly, he has not “acquired” Rani. He has “adopted” Rani as his child. Adopting an animal is not illegal within the mischief of terms used in Sections from 39 to 42 as shown above. Thirdly Rani is not a “wild animal” and hence sections 39, 40 and 42 are of no force in the instant case. The term “wild animal” is defined under Sub-Section 36 of Section 2 of the Act. Accordingly “wild animal” means any animal found wild in nature” If the animal is not “wild in nature”, the words “any animal specified in Schedule I, Schedule II, Schedule, IV or Schedule V, wherever found” added thereto would not apply as the same is a mere qualifying extension of the concept centering around the term “wild in nature”. Rani is never “wild in nature” and hence, these sections are not applicable against Ram Singh Munda. That Rani is never “wild in nature” is proved by the very fact that when the forest officers who are prosecuting Ram Singh Munda transported her to Nandankanan zoo, they had never administered any tranquilizer on her. In full public gaze, she had accompanied them like a very good-natured human being assuming that those two-legged animals might be as good and noble as Ram Singh Munda. But all two-legged animals are not humane. However, if the law enforcers do not believe their own agents who took Rani from Ram Singh Munda’s house to the zoo at Nandankanan without experiencing in her any “wild nature”, they may peruse this much-circulated pictures afresh. Do they find this bear rescued from death and adopted as a daughter by the kind-hearted tribal as an animal “wild in nature”? Prosecuting Ram Singh Munda, the way they have done, betrays their own deficiency in understanding the spirit of Law. The law was framed for “protection” of wildlife, not for prosecution of a protector of wildlife. Members of civil society feel ashamed of what officialdom in Orissa has done to a man who deserves rewards and honors of highest order for the noble and exemplary contributions he has made to humanitarianism. The sections cited supra under which the forest officers are prosecuting Ram Singh Munda do never impose prohibition even on “acquiring and keeping” wild animals. Anyone can do it with prior or post-facto permission from an authorized officer. The authorized officer may grant the permission in fear of power or in getting his palms greased. Except these two unwritten but possible propellants, there is no definite description of circumstances in the body of these Sections that should necessitate issuance of permission. Therefore these Sections are infested, despite amendments, with inbuilt legal lacunae. But when administration relies on these Sections and the person relying on these Sections is not influenced by power or purse, it is clear that he uses his administrative wisdom in granting permission to acquire or keep wild animals. So law has not prohibited acquiring or keeping wild animals but has only stressed on invocation of discretionary powers of the officer concerned in the matter. If officialdom is not prejudiced, it should appreciate that Ram Singh Munda has “protected” the life of the bear cub and is not guilty of any crime as there is no criminal intension behind rescuing the bear cub from sure death and upbringing it like his own child. In appreciation of this reality, the Chief Wildlife Warden or the officer authorized by him can invoke with retrospective effect the discretionary power vested in him in the above mentioned Sections and condone the delay in approach for permission and grant the same to Ram Singh Munda with retrospective effect to regularize this uncommon but welcome act of man’s responsibility towards animals. Far from being illegal, it will fetch unreserved appreciation of the world. According to the Divisional Forest Officer of Keonjhar, the case against Ram Singh Munda, propelled by the above mentioned Sections, is under further investigation and what other Sections may be invoked against him would depend on that. As such, admittedly, the charges are not finally framed. This gives a scope to not frame the case against the poor but upright man. Everybody knows that cases are built up, evidences are cooked up and charges are framed up when officialdom decides to harass any upright person. Let this not happen this time. Wildlife protection Act is a central law that exists in English language. It has never been translated into Oriya and available to peoples like Ram Singh Munda. The officers of forest department who are prosecuting him for having kept the bear cub have never tried to make him and peoples of his category aware of this Act. So, use of this Act against the innocent illiterate man is an act against natural justice. On the other hand, reports coming from the locality reveal that in the presence of the peoples of the area including local forest officials, Ram Singh Munda had left Rani in the jungle twice in order to give it her natural habitat. Both the times, she had come back to his home. So it is clear that the bear was staying freely with Ram Singh for around eighteen months well within the knowledge and with tacit approval of the forest officials; and more importantly, on its own accord after being released to the jungle in presence of the peoples and forest officials. And, forest officials know this. If under exigencies of circumstances, they deny this, then they should react to the highly circulated picture displayed supra. It shows, he was moving the local area in his cycle with Rani clinging to his back. His village of Rutisila under Ghatagaon is a small rural habitat where everybody knows everything that happens in the locality within no time. 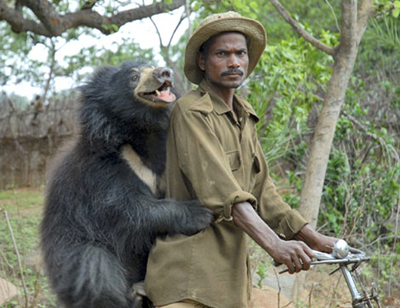 So, the bear clung to Ram Singh Munda during his bicycling on the local roads must have attracted everybody’s attention including that of the forest officials. It must have taken months together for the bear and her foster father to master this practice. If any forest officer of the said locality says he did not know of this, then he is a liar or is mentally dull. If not, then it is clear that the bear was staying with Ram Singh Munda for all these days under full knowledge of forest officials and their non-intervention so far must be inferred as their full approval of the bear’s stay with Ram Singh Munda. Therefore, the present prosecution is a foul play against the spirit of law and is vitiated with unworthy and inhuman motives. So, looked at from any angle, there is no real case against Ram Singh Munda. An honest judiciary will never find him guilty. 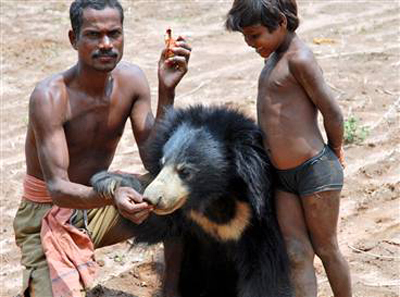 The Wildlife Protection Act never vouches for any prosecution against him for having rescued, saved and adopted the bear cub found abandoned in dying condition in the forests and for bringing her up from infancy to adolescence in a healthy state with all the love and care a man, despite abject poverty, could ever have given to an infant animal, the like of which has never occurred anywhere on records so far in the entire world. We, the people of Orissa have every reason to be proud of Ram Singh Munda, the simple natured hero who has shown how humane can become a man. The forest department should not make an animal of him. Ram Singh Munda is a rare person in the showy jungles of Ramadevs and Ravishankars and innumerable Godmen and innumerable Gods in whose favor propaganda of humanitarianism is cultivated and amplified. Ram Singh Munda is personification of silent sacrifice and humanitarianism, of selfless service and compassion. He is simple in nature and innocent. Though illiterate, he is the finest embodiment of positive thinking and qualities that make man the best amongst living creatures. Enough damage has been done to him by the mentally dull officialdom who could never feel how devastative it would be to his six-year-old motherless daughter by beating up and arresting him before her eyes as if he had committed the heinous most crime by saving an infant animal from the grip of death! No further damage the civil society would silently tolerate. There are officers in the higher echelon of forest department whom I know as excellent and dedicated lovers flora and fauna. I earnestly hope, they will review this case and stop the misadventures of avoidable litigation against a man who is being harassed for his love for the animal world. Talking to Sri Pradeep Raj Karat, DFO of Keonjhar, I have gathered the impression that as an officer he is perhaps not prejudiced. It would not be too much to expect that he stop his lower office from framing up cases against the financially poor but temperamentally magnanimous man who has made so much sacrifice from his scant resources for saving the life of an infant bear and thereafter to rear her up. It would be better, if by withdrawing the prosecution, the forest department could honor Ram Singh Munda for exemplary compassion shown by him to an animal in distress. The wrong done to Ram Singh Munda should be rectified this way. Is anything being done about this? The photos show them all so happy. Now they are miserable. I am heartbroken at this turn of events. Please let me know if there is anything that we can do, sign petitions, send letters, send money. I can organize many people who believe in the right for animals and people to live together in harmony. Subhas, thank you for your clear, heartfelt article. I am concerned about this situation, and would like to help if possible. I live in the United States, and would be happy to send some money or sign a petition. Could you organize something of this sort to help bring a positive ending to this story? You can email me at synergyself@gmail.com. Perhaps with pookerella’s network, mine, and others help, this happy family will find peace and joy again. Perhaps you could also post the contact information for Sri Pradeep Raj Karat, DFO of Keonjhar so we can ask him to drop the charges and return the bear to his rightful place. Thanks again. Heah, what a wonderful website you have. I found it on Google while looking for some baby stuff. Thanks and good luck.